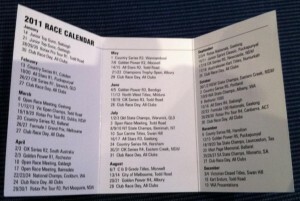 Concept Karting have just taken delivery of the 2011 Victorian Kart Racing Calendar. This business card sized calendar is presented in an easy to read format and includes a Gear Ratio Chart and a Fuel/Oil Ratio Chart. This invaluable little tool is now available at Concept Karting free of charge. Please feel free to call in and ask for one.